Senator Hassan hearing from constituents at Restoration Café in Manchester yesterday about their personal experiences receiving surprise medical bills. 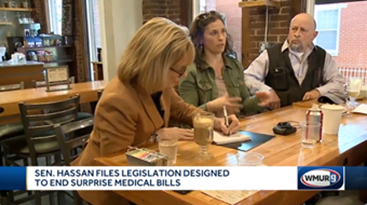 MANCHESTER – Senator Maggie Hassan yesterday met with Granite Staters at Restoration Café in Manchester who have been impacted by surprise medical bills, where they received massive, unexpected medical bills for care that they did not realize was considered out-of-network. Senator Hassan recently introduced legislation to help address this problem. […] Patients in the emergency room are often not in a position to make choices about using in- or out-of-network doctors, but when the bills come due, the dollar amounts can be staggering. "After paying $700 in deductibles, I got the surprise bill of over $1,600 for a five-minute face-to-face time with a physician," said Donna Beckman, of Seabrook. Beckman and others shared nightmare billing stories Thursday with Hassan in Manchester. Hassan recently filed legislation aimed at ending the practice that has caused financial and emotional hardship for patients such as Eliza King, of New Durham, who said she spent countless hours trying to resolve a bill sent to her 11 months after receiving care. "Back and forth, back and forth, and every time, somebody would say, 'OK, it's all set,' and then I would get another bill in the mail, and you're trying to piece together what happened months and months ago," King said. Hassan's bill would require providers and insurance companies to negotiate among themselves when there's a disagreement over the bill. "We need to take the consumers out of it," Hassan said. "This is something people don't have any control over."